The new Vincent Moon-directed film that follows the making of The National‘s 2007 album Boxer is out today. A Skin, A Night offers the gorgeous treatment that this music deserves, making it feel even more special, all wrapped up in moonlight and grainy black and white. The film is being screened at select U.S. locations (and hmmm, should we do a Denver one?) and if you buy it, the DVD comes paired with an excellent collection of 12 rare/demo/unreleased tracks called The Virginia EP. In addition to collaborations with like a song with Sufjan Stevens recorded at Benny’s Wash ‘N Dry in Brooklyn, some great UK b-sides including one called Santa Clara (which I like to pretend is about my alma mater), and that sublime Springsteen cover I posted in April, there are several home-recording demos and live tracks. This cover is one of my immediate favorites on the EP — a mournful, quietly sad song written originally by a Bristol-born singer-songwriter named Caroline Martin. It starts with a fill of organ pipes like you just stopped into that little cathedral, and now are not quite sure what for. Maybe to say a prayer for someone, light a candle. Maybe just to sit in the silence. Quickly the song blossoms within its traditional structure that caused me to wonder at first if this was a reinvention of an old doo-wop tune from a girl group. But there within the simplicity, The National wrenches out new layers of genuine loss and missing someone so much that all you can construct are lines that are three or four words long. Tagged with caroline martin, covers, films, the national, vincent moon. yes we most definitely need a screening here in Dirty D.
thanks for introducing me to The National in the 1st place. I’m Caroline Martin, I wrote Without Permission and love The Nationals version of it…. I prefer it to my own! I first met The National about 6 years ago when we were on the same line up at a tiny pub in London. They asked me then if I would mind if they coverd the song to perform at their gigs… would I mind?! I was honored! I can’t belive 6 years later it’s on a release. I open for them at a couple of shows in UK at the end of this month – can’t wait. Wow, Caroline, thanks for sharing that great little story…I’m envious of the UK fans who can catch your lineup together. I was fortunate enough to see The National two nights ago at the Carling Academy in Birmingham. Caroline Martin did the first part and was standing right by my side on the crowd seemingly enjoying the show when the main set ended with Fake Empire. She immediately ran to the backstage and I thought “What the hell…”. 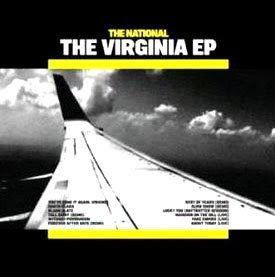 At the start of the encore, only a short few minutes later, Matt Berninger said they would be playing one of his favourite songs only recorded on an EP and written by Caroline Martin. He then invited her to sing Without Permission with them. It was a nice moment indeed!